We are all prone to colds and flu, and it’s not a pleasant thing to get into. Statistics show that adults usually get 2 – 4 colds a year, while children get as many as 5 – 10 every year. More than 200 types of viruses can cause colds. The symptoms of colds develop slowly, usually with a sore throat. It then develops into headaches, congestion, runny nose, fever and cough. On the other hand, flu symptoms start quickly, such as sore throat, cough, headache and high fever. People with flu may also experience diarrhea, vomiting, muscle weakness, and fatigue. The longer it takes for a person to treat these infectious diseases, the longer it will take to clear out the pathogens from the body. Acupuncture balances the flow of energy in your body by inserting needles on specific acupuncture points. It can support your natural immune response and boost the immune system. This can help prevent flu or colds from affecting your body. As you undergo acupuncture, your licensed acupuncturist or therapist will most likely prescribe Chinese herbs to supplement your body’s natural defense and healing capacity. If you have the colds or flu, undergoing acupuncture for colds will relieve various symptoms. These include runny nose, congestion, sore throat, cough, body aches, headaches, chills and fever. Acupuncture with a prescription of Chinese herbs can also speed up recovery. It can also lessen symptoms so as to prevent flu or colds from further developing. Chinese healing methods such as acupuncture, moxibustion and gua sha can provide relief from cold symptoms. These techniques also expel the pathogen out from the body in a much faster rate. Practitioners insert hair-thin needles into certain points along the meridians of the body, activating immune functions. It will also relieve symptoms of colds and flu, while suppressing pain. Most patients usually experience quick relief when acupuncture points are needled. Herbal therapy can also effectively fight the infection and inflammation caused by colds and flu. Herbal formulas can destroy bacteria and viruses, thus alleviating symptoms. It also has a diaphoretic action which takes out the virus and flu bug out of the body. Do take note that it’s important to consult with your medical provider if you have flu-like symptoms before seeking out complementary treatments like herbal prescriptions and acupuncture for colds. Every patient might have a different set of symptoms or infections, which different sets of acupuncture techniques and herbal formulas can address. One or two acupuncture sessions with a herbal prescription are typically necessary to treat colds and flu. If the symptoms are treated early, colds and flu can be completely resolved in a day or two. The most that you will feel during acupuncture is a dull ache, numbness or slight tingling feeling around the base of the inserted needle. Acupuncture is relatively pain-free. As the practitioner inserts needles into specific points on your body, you’ll barely feel them at all. Your acupuncturist may give you a little massage after taking out the needles to lessen any feeling of numbness. Traditional Chinese Medicine aims to create and sustain a healthy balance in the body. In this healthy state, your body has a stronger immune system that can help keep illnesses at bay. Acupuncture for colds is a natural, safe and effective treatment to boost your immunity. It also tackles the root cause of your health concerns, and heals you holistically. Book an appointment with our licensed acupuncturist and Chinese Medicine practitioner now to get a consultation and treatment that can improve your immune system. We also have a herbal pharmacy where you can get a prescription of Chinese herbs, and we ship out herbal prescriptions to your address. Our acupuncturist, Tram Pham, also does phone and video consultations if ever you can’t come by our Santa Barbara clinic. Achieving maximum wellness sometimes boils down to three things: proper nutrition, regular physical activity, and effective rest. There are times, however, when factors get in the way of our achieving these things. In particular, insomnia and the inability to get effective rest at the end of a long day are chief concerns for many. However, acupuncture for insomnia can help you finally get some much-needed shut-eye. There are many causes of poor sleep or insomnia in today’s society. This includes but is not limited to constant and high levels of stress, chronic pain, or another ailment wherein sleeplessness is simply a byproduct. Meanwhile, we should never discount the hazards of not getting enough restful sleep. Among other things, it could lead to heightened aggression, anxiety, increased weight, weakened immune function, higher risk of blood pressure, and difficulty concentrating. In turn, this could lead to reduced decision-making capabilities, poorer job performance, and even life-threatening situations. A growing number of people are not embracing acupuncture for insomnia as a non-pharmaceutical solution to sleep problems. Other than that, it can also be an alternative option to improve overall well-being. There’s actually little conscious choice involved in the matter. Because practitioners intend for traditional Chinese medicine to work holistically, it doesn’t work on a piecemeal basis. As with many things involving Western medical practices, sleep medications only work to address the symptom of sleeplessness itself. They do nothing to address the underlying causes. This means that if the medications stop, the symptoms return, often with a vengeance. The only other choice with this option is to continually take the medications for as long as they’re needed. However, this more often than not might mean taking sleep medications for life. Doing so presents other, even more dangerous risks, including addiction and damage to internal organs. There is a growing body of research on the use of acupuncture for various issues. These studies have found exceedingly few dangers to the millennia-old healing modality—certainly not the dangers presented in the alternative above. Instead, people would often find themselves going in for a series of treatments for a specific condition. Afterward, they come out of them feeling better than anticipated, simply because the other issues they’ve long ignored have also benefited from the experience. To address these diverse sleep problems, the acupuncturist would do a consultation and give a diagnosis, after which she or he would tailor acupuncture techniques along with other traditional Chinese healing modalities, all to suit the specific needs of the patient. We should take into account that it would likely take more than a single session for lasting effects to be felt. This is because practitioners consider acupuncture for insomnia, or for any other issue, to be a corrective procedure. It might take several sessions before the body could recognize its rehabilitation into its proper, healthy and well-functioning state. Specifically, acupuncture can help regulate and improve sleep by directly targeting the possible root of the issue, not just the symptom. The owner and main acupuncture practitioner in Santa Barbara Herb Clinic is Ms. Tram Pham, L.Ac. 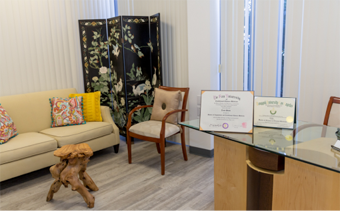 Having studied under the late Master Dr. Richard Tan, she employs the acupuncture system known as the Balance Method, blended with other traditional Chinese medicine practices, to accomplish desired outcomes. Learn more about how acupuncture can help maintain your overall health and wellness. The acupuncturist would zero in on distal points in the body’s energy pathways that, while not immediately obvious, have links to the possible problem areas. Stimulating these points could simultaneously trigger the body’s response to threat and facilitate the start of healing for the real, underlying issue. Acupuncture can lower levels of the stress hormone cortisol, for instance. Meanwhile, it can induce the release of serotonin, which the body converts into melatonin to achieve sleep. The more of this neurotransmitter the body has, the better the quality of sleep at night. That’s not all serotonin is good for. It could also help regulate mood, which means that acupuncture’s effects could also be felt during daylight by promoting the body’s relaxation and the mind’s calmness. By targeting a possible root cause of insomnia like chronic pain, acupuncture could also stabilize the flow of energy within the body; by getting it to achieve proper balance, it could start functioning as it should, releasing natural painkillers and eventually starting the process of self-healing. This is a cycle deeply rooted in the Chinese concept of yin and yang. Licensed acupuncturists insert long, thin needles into the energy points in the skin to achieve results for this condition and for others. If that sounds alarming, worry not. Acupuncture for insomnia at the Santa Barbara Herb Clinic involve premium Japanese needles that are thinner and sharper. This means that there’s typically minimal pain even with regular acupuncture needles. However, for sensitive patients, especially children, these one-off use needles offer reduced sensation. Their use comes at no extra cost. The clinic also operates an Herbal Pharmacy with a range of medicinal powders, teas, herbs, and pills that may be prescribed in conjunction with the main acupuncture treatment, as well as the clinic’s other therapeutic services offered, including tui na, fire cupping, and moxibustion. Even if you live outside Santa Barbara, you can benefit from the clinic’s services by setting a consultation through video or phone call. We could also mail your prescribed herbal remedies wherever you live in the country. Acupuncture might be known to treat minor to chronic health issues. However, did you know that it’s also effective for preventive health care? Traditional Chinese Medicine upholds the concept that besides curing diseases, it is crucial to prevent them. If you show symptoms of a disease or would like to prevent them from happening, acupuncture can help treat symptoms and fine tune your body to its optimum health. It can definitely help you perform to your utmost best as it has long-term benefits for your mind, body and spirit. Acupuncture involves inserting needles at specific body points to treat the root cause of health issues, remove blocks in the energy flow, and promote a healthy balance in the body. It can strengthen the immune system, improve digestion and induce endorphins; which make patients feel healthier and happier after every treatment session. Traditional Chinese Medicine uses acupuncture as a maintenance treatment to tune up the body. Studies in Japan also show that the procedure can help prevent common illnesses such as colds, nausea and many others. Acupuncture balances the different organ systems in the body so that it can boost your immune system and prevent diseases from happening. A licensed acupuncturist can also assess and address early onset symptoms such as sleep disturbances, headaches, mood changes, digestive problems and others to prevent them from worsening or developing into serious medical conditions. An acupuncturist will assess your symptoms and create a customized treatment plan that suits your health needs. The treatment plan, together with a prescription of herbs and lifestyle modifications can improve your overall well-being. For those conscious with their health, they take acupuncture to prevent symptoms from worsening. Regular treatment sessions keep their health in check, and complementing it with a healthy diet and exercise ensure that illnesses are kept at bay. Some people undergo acupuncture even if they don’t have diseases. They take it because it makes them feel good and relaxed after every session. As the saying goes, prevention is better than cure. It is better to keep your mind and body healthy for as long as possible, as it can also save troubles and costs that come with having a disease. See acupuncture as something that doesn’t just treat one symptom or health issue, but it addresses the entire system of your body. It promotes holistic health and wellness that supports your being as a whole. With its physical, mental, emotional and spiritual benefits, you’ll find that the treatment to be truly helpful in preventive health care and wellness. You might feel a slight tingling sensation or numbness when the needles are inserted on specific points of your body. These sensations are brief, and while the needles are in your skin, you’ll barely feel them at all. The side effects of acupuncture are slim to none. It is a low risk treatment that Western medical doctors also see as safe and effective. You can choose acupuncture as an alternative treatment to avoid the side effects that come with synthetic medication. As with all healing modalities, consult your primary care doctor first before taking any other treatment for your health concerns. 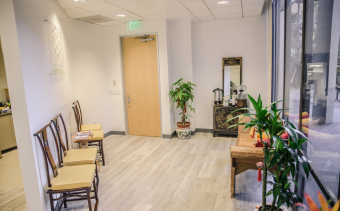 Santa Barbara Herb Clinic offers holistic healing treatments based on Traditional Chinese Medicine, which includes acupuncture for preventive health care. Your session with our licensed acupuncturist will include a complete assessment and customized treatment specifically catered to your health concerns. We also conduct phone and video consultations. If you are around the Santa Barbara or Goleta area, you can come by our clinic as shown on this map. We also ship herbal prescriptions locally and abroad. Book a session now to achieve optimum health and wellness. In this day and age, having healthy energy levels is crucial for us to accomplish our work and duties all throughout the day. With all the hustle and bustle, stressors, and other environmental factors, it’s easy to become tired, fatigued, or lethargic. Our lifestyle habits also contribute to our energy level – whether we have that needed boost during the day or if we easily get tired without having to do anything much. Fortunately, acupuncture for fatigue can help you keep both your physical and mental energy up. We need to take care of our health so that we can have the mental and physical capabilities to perform our tasks, duties, goals and dreams in life. If you easily feel tired, experience chronic fatigue, or just can’t seem to pinpoint the cause of your health issue, try acupuncture as a natural healing method that can treat the root cause of the problem and increase your energy. 1. Acupuncture works on unblocking the energy flow in your body. The treatment involves inserting needles on your body’s specific points in order to treat various systems and holistically bring balance to your health. 2. Your acupuncturist may treat you for stress, and at the same time address your low energy level. Stress and low energy go hand in hand, and acupuncture can treat them simultaneously. 3. Your acupuncture session will also involve balancing your body’s energies. The needles will be stimulating specific body points, called meridians, to increase your energy levels. 4. Your therapist will also promote the increase of Chi (life force energy) in your body, as this helps you become more vibrant and active. 5. Acupuncture for fatigue can also increase blood flow or circulation in your body, which induces the blood to transport oxygen and nutrients to your body’s various organ systems. As a result, it provides you with more energy and stamina. With the rebalancing of energy levels and organ functioning, your mind feels calmer, and your body would feel more energetic and vibrant. Your overall well-being gets a boost after every session. Acupuncture treats a person as a whole, together with the symptoms that needed to be addressed. The positive health benefits of acupuncture also last for a long time. Most people who receive an acupuncture treatment feel more revitalized after a session. Regular treatments ensure that you maintain a good energy level and feel more active in life. Acupuncture also has holistic benefits that affect your mental, emotional and physical health. See acupuncture as the first step towards becoming healthier and achieving optimum wellness. As with other natural healing modalities, your treatment is best complemented with a healthy diet, taking your prescribed medication or supplements, and regular exercise. Your acupuncturist or Chinese Medicine therapist may prescribe herbs or supplements to complement your treatment. The prescription might be different for everybody, as each one has different physiological requirements. Learn more about our Herbal Pharmacy. Acupuncture treatments are relatively pain-free. The most that people will experience after an acupuncture treatment is a dull ache or slight tingling feeling around the base of the inserted needle. While the needles are inserted on specific points of your body, you’ll barely feel them at all. Your acupuncturist may give you a little massage after taking out the needles to lessen the numbing. Acupuncture for fatigue is a natural, safe and effective treatment to increase your energy. It tackles the root cause of your health concerns, and heals you holistically. Set an appointment with our licensed acupuncturist and Chinese Medicine practitioner now to get a consultation and treatment which are specific to your needs.